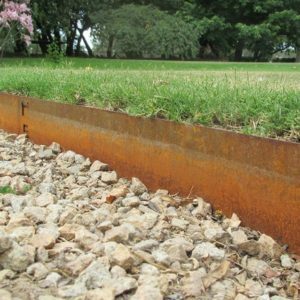 EverEdge Classic (in one metre lengths) in the galvanised and powder coated finish has a 1.6mm gauge and is available in three different depths: 75mm, 100mm and 125mm. All metre lengths have six 95mm long spikes. Standard powder coated colours are black and brown in the 75mm, 100mm and 125mm depths. 75 m depth also available in plain galvanised (silver). Discounts are available for large orders. We give a 5% discount on all orders of EverEdge Classic of 50 metres or more and a 10% discount on all orders of EverEdge Classic of 100 metres or more (when ordered online). EverEdge Classic overlaps and interlocks so remember to add 6% to your actual requirement (that is 6cm per metre of EverEdge Classic you use).